Three big rivers e.g. Teesta, Brahmaputra and Jamuna flows through Gaibandha district. The district is extremely poverty and disaster prone. The people have to lead their life by struggling against flood, river bank erosion, drought, cold spell, and seasonal food crisis almost every year. Economy of the area is completely dependent on agriculture, which cannot ensure working opportunity for the large number of landless day laborers round the year. During the lean period, the people did not have any other option than selling their labor in advance. Male members of many families used to go to other places of the country in search of work, leaving the women and children behind in big uncertainty. Economic and social status of women was not good at all. Although they had to work day and night to take care of the children and other household works, they had no proper recognition. They had very limited access to health and education. They were not aware about their rights. Different types of superstitions, religious fanaticism and backward social dogmas at rural areas had been dominating the life of women. In these circumstances, a group of dedicated social activists established Gana Unnayan Kendra (GUK) in 1985 for the purpose to reduce poverty by bringing positive sustainable changes in the lives and livelihoods of disadvantaged poor people. 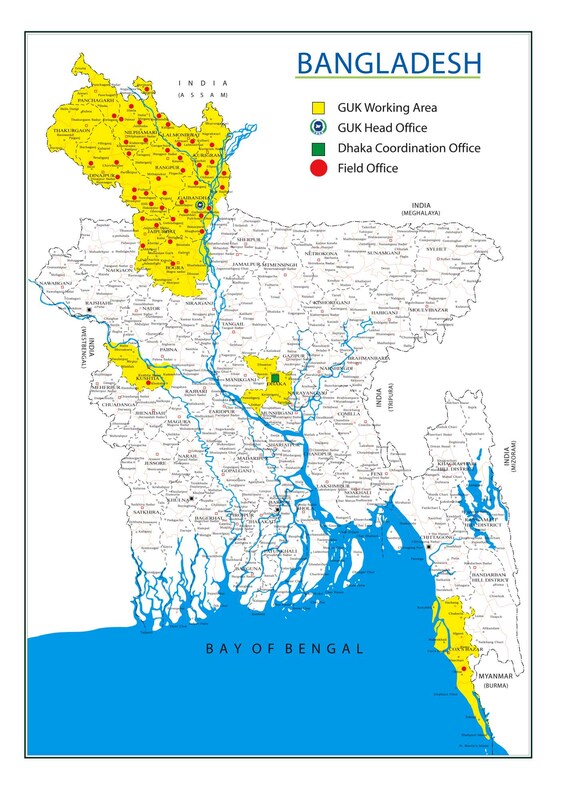 Initially the organization started its activities in Gaibandha district and presently it is working in 12 districts across Rajshahi, Rangpur, Khulna and Chattagram divisions through its 75 offices in district and upazila level including Rohingya Refugee camps in Ukhia and Teknaf Upazila of Cox’s Bazar district. Over the years, through continuous and sincere efforts the organization has gained very well reputation and acceptance and built good relationship with programme participants, community people, local administration, local government institutions and other relevant stakeholder in its working areas. Field visit by Ms. Petri Hofland from Kerk in Actie & ICCO representatives.